It's September 2016 and major vendors have prioritised differently when it comes to emoji support. Knowing which emojis to use safely involves keeping track of what is supported where. Let this be a brief guide at what's out there. Release in June 2016, Unicode 9.0 included 72 new emojis including shrug, face palm, and selfie. Above: Unicode 9 Emoji Support in Android 7.0 Nougat. Samsung have previewed Unicode 9 emoji support but this has not yet been released. 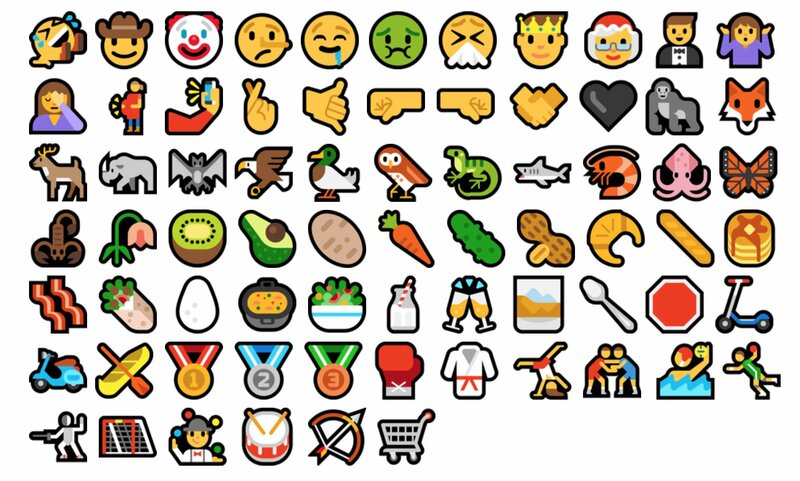 Above: 72 Emojis from Unicode 9 in Windows 10 Anniversary Update. 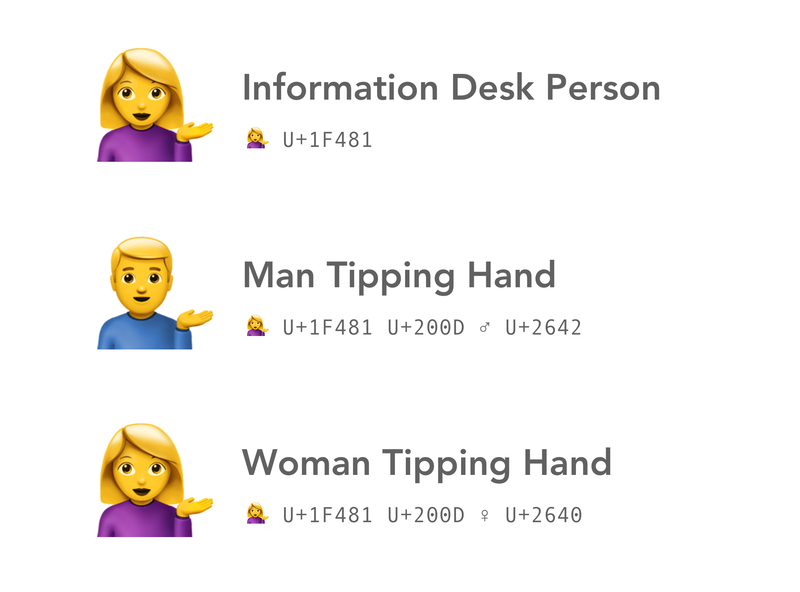 Unicode has been working on gender-related updates since mid-2015, and this has culminated in a draft list of new "gendered" emojis planned for release in November 2016. Professions — new professions such as teacher or scientist, which each have female and male versions. Above: Gendered Roles are female and male equivalents of existing emojis. 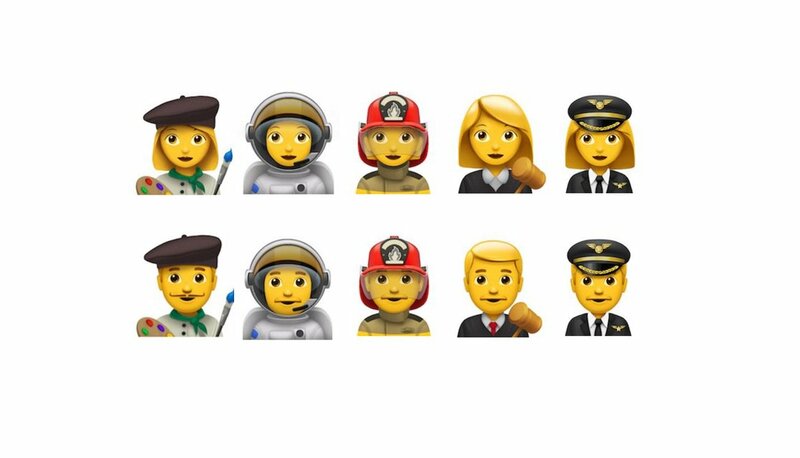 Apple has skipped Unicode 9 support in iOS 10.0 and gone straight into supporting Gendered Roles. 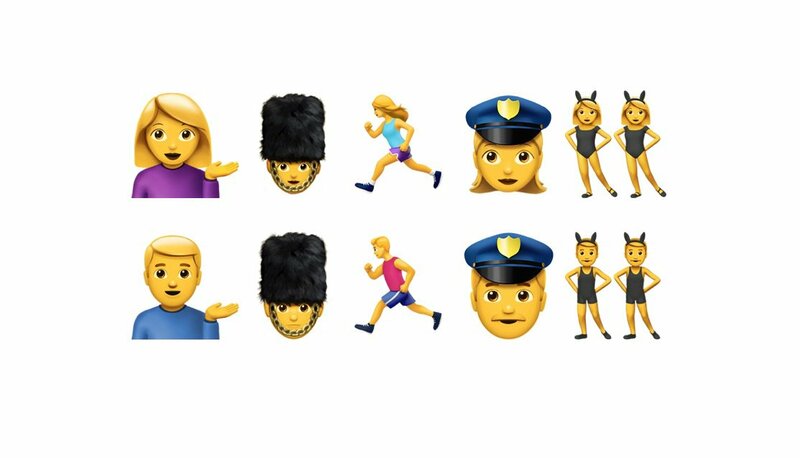 This means options such as a 👮‍♀️ Female Police Officer and 💇‍♂️ Man Getting Haircut are included in iOS 10, but Unicode 9 emojis such as 🤰 Pregnant Woman and 🤵 Man In Tuxedo remain unsupported. Given this work is still a draft at Unicode, it may not be surprising that it's not yet widely supported. The profession list in Emoji 4.0 has undergone a few updates since first proposed by Google in May 2016. This work is still ongoing, and yet to be shipping in any major operating system. It's likely we'll start to see support for this later in 2016. Facebook released a brand new set of emojis for Messenger in June 2016, but this only includes support for Unicode 6.1 and below. This means 212 new emojis await when Unicode 7, Unicode 8, and Unicode 9 characters come to Messenger. The exception here is that skin tone modifiers from Unicode 8 are supported. Above: Messenger Emojis are beautiful, but the set is now incomplete. LG and HTC have not had major emoji updates in a while, and Mozilla's Firefox OS is effectively dead. Be careful out there with your emoji use right now! Unicode 9 characters sent from Android to iOS will show the dreaded question mark box, while Gendered Emojis sent from iOS to any other system will show gender symbols after many of the humans. Might I take this moment to recommend signing up for Emoji Wrap, our free monthly email to keep you on top of the latest emoji news. Or follow Emojipedia on Facebook or Twitter.